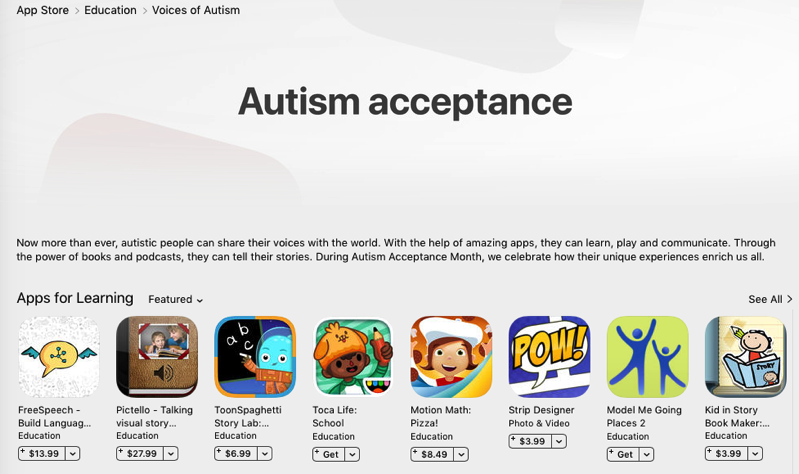 Apple has announced a new collection of apps for Autism Acceptance Month, currently ongoing for April. On top of iOS apps, watchOS apps such as Proloquo4Text has made it easier for those with ASD to communicate with people, as the latest version allows users to speak messages aloud directly from Apple Watch. Another ASD app is award-winning symbol-supported communication app Prooquo2Go, which helps people grow communication skills. The new app collection in the App Store, titled Voices of Autism, details curated apps for learning, while also features related books and podcasts. Also for April, Apple is offering a couple new Field Trip sessions available in Canada and worldwide: Storytime with Skoog and Rock Out with Skoog. Students will use this tactile and accessible instrument which is inclusive of children with disabilities, which makes music fun and inspiring.